This edition of the Australian Women's Weekly commemorates the service of the Royal Australian Navy during five years of fighting in all the world's oceans during World War II. Used with permission of the Australian Women's Weekly & BAUER Media Group. During its 75 years of service, the Royal Australian Navy has protected the carriage of the Nation’s wealth and has contributed substantially to the security of the Nation itself. Today the RAN continues to play its part, which is so important to the development of Australia. In 1988 an International Fleet Review was held in Sydney Harbour as part of the Royal Australian Navy's contribution to Australia's Bicentennial Year. 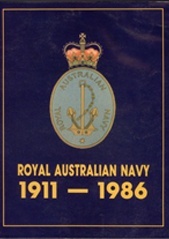 This commemorative publication captures in pictures and words the contribution made by the Australian Navy towards nation-building and highlights those ships, submarines and aircraft that featured in the naval review. 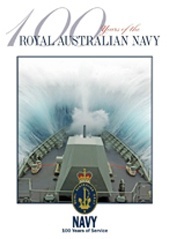 Containing over 50 articles and a plethora of eye-catching photographs, 100 years of the Royal Australian Navy has been compiled by an impressive array of naval subject-matter experts, from historical commentators to authorities on the latest defence technologies. 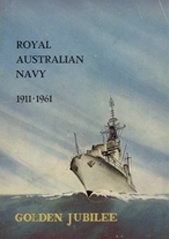 The book covers the extensive history of the Royal Australian Navy, and examines its involvement in conflicts around the globe from WW1 and WW2, to Korea, Malaya, Indonesia, Vietnam and more recently the Middle East. It also looks at the Navy’s current status, its fleet, programs and priorities with dedicated articles on naval aviation, submarine and hydrographic services, border protection, clearance diving, peacekeeping, supply and logistics, engineering, health services and training, as well as exploring the future fleet and technologies that will shape the Navy of tomorrow. 100 years of the Royal Australian Navy will be available in hard copy for serving naval personnel and is available for all online.